A new recycling scheme set up by Fareham-based waste management specialists Cleansing Service Group (CSG) will benefit children living and working in slums surrounding an African municipal waste dump dubbed the Mountain of Death. The notorious 30-acre dump, at Dandora on the outskirts of the Kenyan capital, Nairobi, is one of the largest in Africa and located in one of the city’s biggest slum areas. It was closed at the end of 2008 after being used as the unrestricted dumping site for all waste generated by millions of Nairobi’s inhabitants. At one point, more than 2,000 tons of mixed garbage was being dumped there daily, including industrial, domestic and chemical waste. A United Nations Environment Programme research team said the dump posed a major health risk to residents, and especially to children. Almost half the children tested had concentrations of lead in their blood exceeding internationally acceptable levels and were suffering from high levels of sickness. Despite its closure, the dump remains the only source of income for many impoverished local residents, including children, who scavenge the rubbish mountain in search of food and recyclables they can sell. 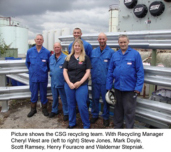 When staff working at CSG’s award-winning industrial waste treatment and recycling centre at Cadishead, Manchester, heard of the children’s plight they asked the company’s management team if part of the proceeds from a new recycling venture on the site could be donated to charities looking after the Dandora children. A dedicated five-man Recycling Team will run the £200,000 CSG plant which will sort and recycle plastics, wood and cardboard which formerly went to landfill. Plastics will now be treated on site and sold on for re-use in the manufacture of a range of products such as drainage pipes. Cadishead site manager Jen Cartmell said: “The plant will soon be fully operational and we hope eventually to be able to make a real contribution to improving the lives of the Dandora children living in a community where lives have been blighted by the effects of uncontrolled waste dumping.